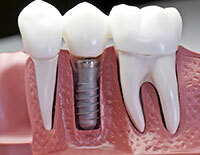 Dental implants are so well designed that they mimic the look and feel of natural teeth. Detnal implants are usually made of a synthetic yet biocompatible material like metal or ceramic. For more information on dental implants in the Englewood, NJ area call Come Dental Group at (201) 569-5121!